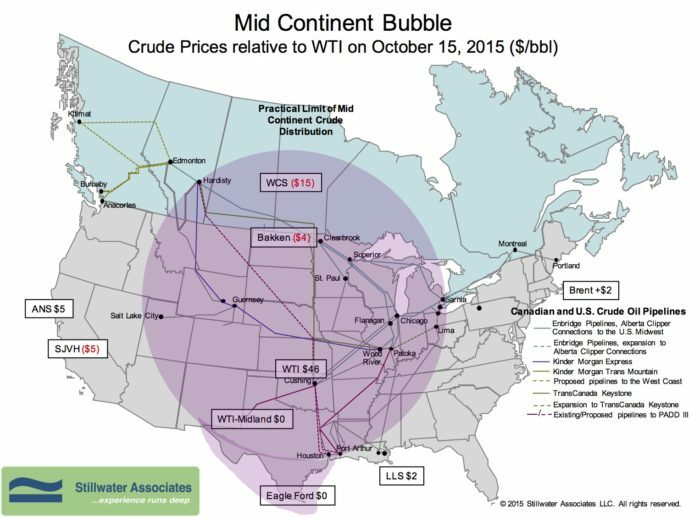 The October Bubble Map shows WTI holding steady at $46 since our last blog in August. The WTI/Brent differential has narrowed to $2 over WTI. The Bakken discount has also narrowed to $4 under WTI. The Western Canadian Select discount has widened to $15 under WTI. On the Gulf Coast, crude oil from the shale formations in Texas like Eagle Ford were priced at parity with WTI and Louisiana Light Sweet was $2 over WTI. On the West Coast, the Alaska North Slope differential was $5 over WTI. The really interesting phenomenon is, for the first time in Bubble Map history, the San Joaquin Valley Heavy (SJVH) discount is greater than the Bakken discount. SJVH was priced at $5 under WTI on October 15th, probably due to the continuing problems at the ExxonMobil (XOM) Torrance refinery. Many of us at Stillwater are XOM Torrance alumni, and we pay close attention to what happens at the refinery, especially since the electrostatic precipitator (ESP) explosion. When it’s running, PBF’s most recent acquisition provides about a fifth of the gasoline supply in Southern California, 155 thousand barrels per day (kbd). Torrance is currently down, but not out. The refinery has limped along since February, running about 70 kbd of crude oil. It is not producing gasoline, but it is making jet fuel, diesel and fluid catalytic cracker (FCC) feed. As part of the sale agreement with PBF, XOM is responsible for the repairs the refinery requires. This is no easy task because, as was noted in the news coverage of the explosion back in February, “You can’t just get a new ESP off the shelf.” In addition to the engineering problems that must be solved, XOM must appease angry neighbors and legislators, answer for OSHA violations, and petition the South Coast Air Quality Management District (SCAQMD) for air quality variance in order to perform repairs. This refinery-owning business is not for the faint of heart. It is estimated that the repairs will be completed and the refinery will be running at capacity by February 2016, and the deal will close by second quarter 2016. PBF is taking a big risk taking on this big refinery; but the reward will likely be worth it.